Long Branch — On Wednesday, Long Branch welcomed 38 graduates of the City of Long Branch Ocean Rescue Surf Lifesaving Academy, who had proven they had what it takes to become lifeguards. 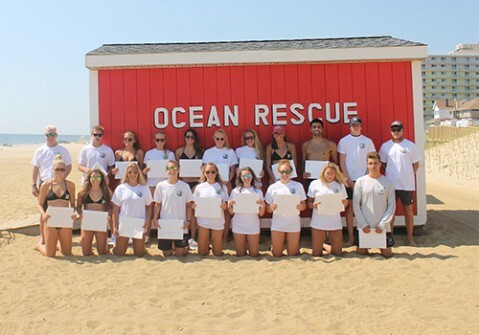 Long Branch welcomed its newest lifeguards, who completed a challenging 40-hour certification course. Standing, left, is chief instructor Dr. Gene Hession. Chief instructor for the course Dr. Gene Hession says that it’s not a simple task to be certified as a lifeguard in the city. This is a U.S. Lifesaving Association Certified Training course, which takes 40 hours of work. Half of that is in classes, the other half are beach drills, including a timed 500-meter swim. 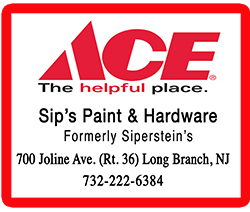 “We are the only USLA certified training program in the state of New Jersey,” Hession says. The highlight of the classroom part of the academy is a lecture, via Skype, from Dr. Justine Sempsrott, an expert on drowning and the art of resuscitation, who has been recognized with awards such as the National Drowning Prevention Alliance’s 2015 Lifesaver of the Year. Academy students also needed to review a 370 page manual, and pass a multiple choice test to receive their diplomas. Besides Hession, other instructors included Bryan Gleason, Robbie Whitacre, and Elizabeth Racioppi. Over the last five years, more than 100 lifeguards have graduated from Long Branch’s course. Many of the graduates posed for a photograph on Wednesday morning, by lifeguard rescue shacks near the Morris Avenue beach, after receiving their diplomas .